With the economy in the dumps, more and more people are considering a ‘Staycation’ instead of a vacation. The idea is that there are plenty of inexpensive options in and around your own hometown that provide equal entertainment value compared to traditional (and often expensive) trips to other locations. I tend to agree with this as I know my family doesn’t take advantage of all there is to offer in our own backyard. I’ve been thinking about the ‘rejuvination’ effect of going on vacation, and whether this can be accomplished at the same level if you don’t physically get out of town. I think it can. I also think fundraising professionals should consider a ‘Professional Staycation’ several times a year. They might just find themselves rejuvinated as a result. A Professional Staycation?!?!? What, you might ask, in the world are you talking about? Just keep reading and I’ll explain. In recent years, professional fundraisers have been asked to do more and more. Raise more money, slash the budget and still raise more money, take on additional responsibilities and keep up with new strategics and technologies that are growing more rapidly than ever before. And while you’re at it, raise more money. This has led to increased stress, higher turnover and an incredibly busy work-life balance. If your life is balanced at all. While we’re working harder (and hopefully smarter) and raising more support for our organizations, we often forget the actual results of the work we do. It isn’t about the money we raise. It’s not about how many donors we generate. This is one time I’ll defend throwing metrics out the window and I’ll tell you to remember the following: It’s all about the good work our organizations do. And too often we forget that. As professional fundraisers, we provide financial support to the best and brightest. And those who are most in need. We help students receive an education that otherwise wouldn’t be able to do so. We provide funding for research to cure cancer, save natural resources, build better mousetraps and more. We provide shelter to the homeless, food to the hungry and healthcare for those who need it. We do so much more than raise money. We’re an essential part of a successful team. Whatever your organization’s niche is, that team is making a difference in the lives of hundreds, thousands or millions of lives. In short, we make the world a better place. I know that sounds a bit arrogant, but it’s true. And I challenge you to take a ‘Professional Staycation’ to remind yourself why you do what you do. When you’re done reading this post I want you to open your calendar and block a day in the near future for your staycation. When that day comes you are to turn off your computer, put down your pen, turn out the lights and get out of your office. Spend the day meeting somebody your work has helped or otherwise seeing the results of your work. Whatever your organization does, put yourself in touch with those who directly benefit from your fundraising efforts. Maybe you could meet a student who received a scholarship that made college possible. Maybe you could talk to a researcher working to develop automobiles that run without fossil fuels. Maybe you could have lunch at the shelter your fundraising supports. Maybe you could meet a patient receiving life-saving treatments in your clinic. Maybe you could spend time wandering around campus watching students enjoy the fruits of your labor. Maybe you could wander around your museum. . . afterall your work helps maintain it. I don’t care what your organization does, I’m sure there’s an opportunity for a ‘Professional Staycation’ to remind you that you are a valuable part of the team. I know you already have report after report that can prove how successful you’ve been. File it away. Numbers, charts and graphs really tell the story. Delete them. I’ve got a better idea. . .
Get out there and experience that success in person. OK, that’s it for now. You have a homework assignment to plan and take your Professional Staycation. Leave a comment to let us know what you’re doing or what you’ve done. Tell us how it went and how you’re making a difference. I look forward to hearing all about it. Speaking of vacations and staycations, the family and I are taking a little vacation next week. The GettingGiving Blog will take the week off as well. I’m pretty sure my wife wouldn’t appreciate blogging on vacation, so there won’t be any new posts next week. I’ll be back soon enough with one of my favorite topics that just happens to be related to my vacation. Maybe I can call next week ‘research’ and write it off. Just kidding, Uncle Sam. Until next time, enjoy your staycation! The subscribe function is working again. On the right side, enter your email or use a feedreader. My apologies to those who had problems earlier. Vadim Lavrusik has written an interesting blog post about 10 Ways Universities Are Engaging Alumni Using Social Media that provides some great information and links to examples at a variety of institutions. Included in the blog are examples related to annual giving, school-specific social networking, and more. Nothing else to say, but wanted to share the link for your enjoyment. The Pew Internet & American Life Project just released an interesting report on ‘The Internet and the Recession’ that I found fascinating. This study shows how a lot of folks are using the internet in a variety of ways to help them survive these tough economic times. One scary statistic reported is that 35% of all Americans have seen their investments lose more than half their value and that percentage grows to a whopping 44% for those with household incomes of $75,000 or more. You might be thinking right now ‘DUH! The economy’s horrible, where have you been?’ but what I found really surprising was the Pew survey in April that indicated that even in these tough times, people are reluctant to give up their internet access. 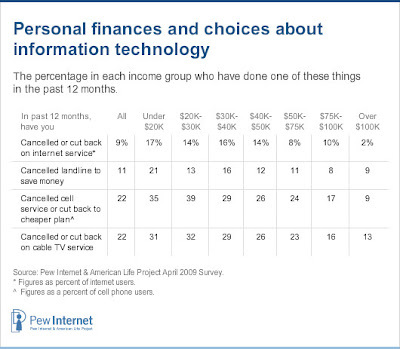 Only 9% cancelled or cut back on internet service while much higher numbers of Americans were cutting Cable TV or modifying (or eliminating) cellular phone service. 22% gave up the TV and/or reduced or eliminated their cellular service. I don’t know about you, but this amazes me. I LOVE my internet. I mean I REALLY REALLY love the internet. But my television comes first. I think I might starve to death before I turned off my satellite dish. It’s still great background knowledge as you examine your internet strategies, justify budget infusions for your electronic initiatives and generally think about this channel for getting your message across. Seems people really are addicted to this internet thing. Speaking of getting the message across, I’m not sure we’re getting the job done in that arena. When you look at the original Pew survey in 2000 and the updates they have done up to 2009, growth in certain areas has been astounding. “Make a donation to charity” has definitely shown growth, but compare it to similar types of transactions such as buying a product, making a travel reservation, or using online banking. The growth is significantly less. People are turning more and more to the internet for financial transactions, but the growth in online giving lags the rest of the field. It might make sense for us to take a look at that statistic and determine what we’re doing (or not doing) to impact it. It’s important to note that everyone has to bank and buy stuff, but not everyone makes charitable contributions. This might be enough of a factor to cover the difference, but it’s still worth a more careful examination. If only I had the time and resources!! NOTE: Click the chart to enlarge. Or find a magnifying glass to read it. The Pew Internet and American Life studies can be found at www.pewinternet.org – if you haven’t spent time looking at their reports, you’re really missing something great. Interesting reports and a wealth of information is just a few clicks away. Much of what they have done is incredibly helpful to annual giving professionals. Good thing you didn’t turn off that internet access! I returned late last week from an annual gathering of fundraising professionals and, as usual, I feel refreshed and full of new ideas. Both the breakout and general sessions were interesting, full of lively debate and provided more than a few take-home items that can be implemented in my own shop. Our hosts were wonderful, and everyone agreed it was a great event. Yet I feel a bit sorry for those who missed out on the best opportunities to learn from their peers. You see, I find that at just about every conference I attend the best ideas are shared not by a presenter or at a conference table. They’re shared over dinner, a glass of wine (or tequila) or in some other social setting. And many folks just don’t take advantage of these great networking situations. This particular conference is one of my favorites because I’ve known some of the attendees for nearly 20 years. Some are my oldest friends and at at each conference we welcome others who are new to the business or simply new to our little slice of the fundraising world. We routinely gather at lunch, dinner, hallways, watering holes and anywhere else we can to share ideas, ask for help with challenges we are facing, or just to let off a little steam. Each person brings new ideas, new insights and more than a few laughs. Those choosing not to join their colleagues for dinner or otherwise are missing not only a great time, but a great chance to learn from others in similar positions. Whether they order room service or only hang out with a few people from their own institutions, they’re shorting themselves of one of the best parts of any conference. They’re the wallflowers of the 8th grade dance. They’re present, but they’re missing all the action. You see the people you work with every day. Do you really need to go away to a conference only to have dinner with the same old crowd?!?!? The friendships and partnerships that are formed during the social time at a conference have benefits that last long after the last attendee departs. I’m confident that I can call any one of numerous colleagues I’ve met over the years to ask for advice or to bounce a crazy idea off them. And I love it when they do the same. I cherish our continuing friendships by phone and email, even when miles apart, and look forward to the next time I’ll have the chance to be with them in person. I like to hear about their families, vacations, personal and professional triumphs and more. One even owes me a CD of his band but it never seems forthcoming. You know who you are! So my challenge to you is to get out of your hotel room and spend some time with others at your next conference. Don’t worry about checking your email, the great movies on pay-per-view or getting 16 hours of sleeep. Put yourself out there and make a few new friends to add to your professional network. I was once told that as long as I brought home 3-4 concrete ideas to help my program improve, I probably got my money’s worth from a conference. I’m going to add to that. Make 3-4 new friends too. They’ll probably last a whole lot longer. Fifteen (yes, fifteen) five-year-old kids swarmed our house yesterday to celebrate my daughter’s 5th birthday. Fun was had by all and she received many nice gifts from her friends. Once the party was over, we explained to Chelsie that we’d all sit down to write thank-you notes to each of her friends for attending the party and for the gifts she received. To be honest, at this age that really means Mom and Dad will write the note and Chelsie will sign her name. I think this is such a critical skill to teach, even if she doesn’t follow in her fundraising father’s footsteps!! In the age of e-mail, the hand-written note is sadly becoming a relic of the past. Too often, quick and easy trumps sincere and thoughtful. I’m yet to meet someone that doesn’t appreciate the time and energy spent on writing a handwritten note. It shows a level of personal attention that is nearly impossible to replicate. You might even think of it as one of the first social networking tools! For several years I had the pleasure of working for a true master of the handwritten note. He set time aside almost every morning to write notes to a wide variety of donors, friends and others. Some were to express his appreciation for a gift. Some were sent when he learned of a particular milestone or achievement. Some were simply to say ‘hello’ and let them know they weren’t forgotten. I’d bet every single note was greatly appreciated. For large organizations, it’s not possible or practical to send a handwritten note for every gift or to every donor. But don’t discard the idea entirely. Whatever the size of your audience, I think it’s worth the effort to add the handwritten note to your acknowledgment and communications strategy at some level or type of giving. The same holds true for those donors who need a little extra attention – it’s time well spent even if they haven’t made a gift recently. I think the handwritten note is one more way that we can show appreciation and connect with donors in a manner that sets our organization’s relationship with them apart from others. So get out your favorite pen, a stack of cards and start writing. Don’t over-think or over-engineer the process, just write what you’re thinking. Your donors are worth it. Now, back to the recovery process. That birthday party wore me out! I came across an interesting article in Fast Company Magazine tonight about overhead costs in the not-for-profit world. The author, Nancy Lublin, does a great job in a very concise manner of educating Fast Company readers that overhead costs aren’t the best or only metric for evaluating nonprofit organizations. Most donors understand that nonprofits don’t work in some alternate universe where there are no expenses involved to conduct the business of raising funds. Some, however, believe that the business we’re in should find a way to do what we do at no cost so that 100% of funds raised can benefit whatever our mission is. This simply isn’t possible. I hear this often in the annual giving world. Annual giving is inherently more expensive than major gift fundraising. The cost to raise a dollar is simply higher when you’re dealing with mass mailings, telemarketing and other forms of fundraising that acquire first time donors, renew donors with smallish gifts and do all the work necessary to build a pipeline for major gifts in the future. While this makes sense, some are quick to ask why nonprofits should continue to invest funds in such an ‘inefficient’ part of the development program. The best answer to this question is to look at each and every major gift donor your organization has and see where s/he started their philanthropic relationship. Usually it’s with a smaller gift, many years ago, that was appropriately recognized. Over time the relationship grew, the donor became more involved and interested in the work you’re doing. The gifts became a bit larger and eventually the organization is able to help that donor realize their philanthropic dreams by making a major gift. Everybody wins, and the investment made many years ago in a program that looked inefficient in the short-term suddenly looks like the best investment you ever made. In the business world, they might call that a loss-leader. In ours, it’s just a strategic investment in the future. If you invest wisely, have a solid case for support and engage your donors appropriately, it’s one of the best investments you can make. If you’re reading this, I’m probably not telling you anything you didn’t already know. But it’s nice to be reminded that the work we do is important and ultimately leads to the kind of transformational gifts that make our programs successful.